A suggestion: If you are squeamish, or don't like the sight of dead bodies, play another game. There are Corpses-a-Plenty. They are not gory, just numerous. Further, if you don't enjoy keyboard controls but prefer mouse-only, play another game. For a printer-friendly checklist-style guide, click here. Tips: Startup: You must always begin with Disk One in the drive. Occasionally you can get a message that the wrong disk is there, even if you know the right one is present. If this happens, right-click on My Computer, right-click on the symbol for your CD drive, and choose "Eject." Then put disk one back in. This should correct the problem. Sometimes you walk like you are bogged down in molasses. If this happens, just save right where you are, and re-load the game you just saved. Sometimes you seem to be stuck in close-up views and can't back out. Try either the right mouse button or the F3 key. Alicia says good night. She has a pet Mynah bird, Alfred, whom you will soon meet. He interprets her sign language and becomes her voice. She is not deaf, she just cannot speak. After she leaves for bed, you observe a green car and have a momentary psychic flashback to the time your parents were killed in a crash. Go into the office, the room at the foot of the stairs. Straight ahead is a file cabinet. The drawers are locked, because their labels are scrambled. Rearrange them to spell six Hitchcock movie titles, unlocking the drawers. Examine each one (two are empty) and read the documents and take the videotape. Go around the near side of the desk and open the top left drawer. You find a document from Dr. Murchinson explaining Alicia's muteness, and a list of cast and crew members. The information you just found gets entered automatically into your Palm Pilot. Any time you wish to review the data, open the Palm with F3, or the right mouse button, and the personal data button is on the bottom right of the device. As you gather clues and information, it accumulates there. All inventory items also collect in the Palm. You can get to the inventory with either the F3 key or the right mouse button. Play the two messages on the answering machine; one from the local cop, and one from 'Don.' Take the stamp. You can also take the scissors, but they are just extra baggage. Go to the TV set to the left of the safe. You can get there either by going behind the chair, or around front of the desk. Open your inventory and select audio tapes, and put your tape in the VCR. Robert Marvin-Jordan welcomes you, gives you a clue about the gate, and sends you to the kitchen. Talk to the bird. Ask it about Alicia and Brandy. Drink the ale, take the apple, and eat the chicken leg, prompting a flashback. "Despicable creature!" Alfred apparently does not approve of eating birds. Behind the bird are two cupboards. From the one on the left, take the glass tumbler. It goes on the counter. From the cupboard on the right, take the 20-year old brandy. It goes into your inventory, along with the Topaz Stopper. What was that Robert said about a 20-year-old gem? You can get two ice cubes from the freezer and place them in the tumbler along with some brandy, or give the bird some brandy straight up. He likes it either way. Looking at the top shelf of the Fridge, you find that Robert has a serious medical condition. (You could take some butter with you, but won't need it until later. It will still be there. Let's not get our pockets greasy.) Exit the kitchen, and exit the Manor. Head towards the pool, down the stone steps, and to the gate. Close up on the lock, use the Topaz Stopper to reveal the Shadow Card. Take it, and go through the gate. Optional: before going to the gate, you can turn the other way when you leave the house, and go to the red car in the driveway. There, you can retrieve some diving equipment. It's unnecessary, because you will have another opportunity to get diving gear later at another location. Go to the soundstage. By the way, whenever you are outdoors. your Palm device has a map you can access by pressing F2. You can zip to locations, provided you have visited them at least once by selecting them on the map. Here's a cheat, sort-of. As you walk past the Hotel, step inside and back out. Now it will be activated on the map. (on the map interface it's called 'Motel', but on the Marquee, it's called 'Hotel Royal.) Keep going to the Soundstage. On the way, be observant. Notice the location of the Church, next to the small mountain. You also get a quick view of a building (the Restaurant) south of where we are. (You can tell it's south because of the shadows. The manor house, which faces north, is the easternmost building, and the church is the furthest west.) Optional: You can take the time to visit every possible location, then the zip mode will be fully activated. From East to West, the locations are: The Manor House, the Pool, the Waterfront (way out back of the house to the south), the Hotel, the Marsh, the Restaurant, the Soundstage, the Outdoor Sets, the Office, and the Church. If you do this, don't bother with the waterfront or the marsh; you only go there once. Enter, and Meet Jack Danvers. He's Robert's valet. Tell him yes, you are Shamley, and no, you won't do the part. He gives you information, and a reason to play the part. Go to the stage, approach the actor-dummy, and press <space.> You are 'attached' to the dummy. Just walk off stage and leave it there. Then go to the microphone. Jack rehearses you. Express yourself. Run: Shift + walk. Jump: X-key. Draw gun: F3 and select gun. To put away gun, F3 and select it again. He tells you to walk to the mark. Do it, and act your part. When it's 'in the can' you are done with your acting career; don't give up your day-job, please. Go talk to Jack about the Motel, the Bentley, and the remaining topics. You gain clues as to the nature of the film project. To get to the Restaurant, exit the Soundstage, and go around back and keep going, up some steps, and back east toward the Manor. Look at the bar-stools for a clue. Go to the rear tables for clues and psychic flashes. Look at everything possible on all three tables. Find the key to the kitchen behind the picture above the jukebox. Go into the kitchen. Turn around and switch on the light. Have a look in the oven by turning it off first. Look in the drawer on the other side of the kitchen In the drawer, you will find two items you can take: a knife and some Scotch tape. The knife will come in handy many times; I found no use for the tape. Go outside, around back of the kitchen and climb the ladder. Cut the rope by using the knife. Something falls to the floor inside. Go have a look. One of the potato sacks is on the floor. Open it with your knife. Oh, it's our first corpse; not the last to be sure. Now what? Someone has turned on the gas and jammed the door. Hammer away at the door with repeated application of the space bar. When you get out, go around by the ladder and turn off the gas. Go back to the kitchen. Examine the body with the magnifying glass mode. Take the key from the hand, and the incomplete audio recorder from between the arms. Other interesting spots are the back of the hands, where someone inscribed "Actors are Cattle" and apparently on the forehead too; and a place on the top of the head, where you get to hear a gruesome comment. Exit the Restaurant and go to the Hotel. Look at the guestbook. One of the names, Michael Armstrong, reveals his true name. This info goes into your palm. You will eventually need to connect together the real names and the stage names. Go behind the desk and examine the mailbox for Room 322, to see a psychic flash. Exit the lobby by the back door, to reach the inner courtyard. To find Room 322, walk straight ahead until the view changes, then turn left and go to the wooden stairs and up. You will be poking around many rooms. In general, always look in the closet, look at the TV stand and maybe the drawers beneath, read the Bible on the nightstand, and look through the bookshelves. Throughout this process, you will gain information about the cast and crew. (This room is the only one without all those features.) In this room, turn on the lights, and examine the lamp by the bed to find an audiotape. Go into the bathroom, click on the shower curtain and find a body. Close-up, look at the hand to learn her identity. You can lift the toilet seat and retrieve an ear plug. If you combine the ear plug with the incomplete tape recorder, you can listen to a clue about the actor and his part in the murder. (Thanks Lynda for discovering this one!) Open the panel below the vanity and open the water meter to find the control panel key. Exit, go down the stairs, turn right (towards you) through the little gate, out of the courtyard, and toward the sea. Make your way back east (toward the Manor) and eventually to the dock. From the Wheelbarrow, take the burlap cover. Note the 'measurements.' Go to the end of the dock, and step into the boat, Take the diving mask from under the seat. Click on the oars to row the boat. Underwater, turn and swim to the body suspended there. Close-up, examine the belt and plug in the 'measurements.' You take the body aboard, and close-up, take the video tape. Cover the body with the burlap. Use the map (F2) to zip back to the hotel. Go behind the desk and open the Control Panel. See the document stashed in the door. Click on the yellow switch for a Flash. Who's watching Whom? Go out to the Courtyard, and straight ahead. When the view changes, instead of walking to the wooden steps, go ahead, then turn left into the grassy area. Find the red sock (Flash of the Production Designer) and the key to the scaffolds. Players: The next section applies to the early release, in the UK and Europe. The later edition, released in the US does not include the difficult arcade sequence. Just skip to Chapter Two. Do not climb the ladder to the top until you create a saved game. Go back into the inset and climb the ladder, up to the top. At the top, you will automatically press a switch, turning on the moving lights. You must cross the planks without getting knocked off by the lights. Actually, the lights are not a real problem, walking accurately IS. Be sure you are facing exactly in the right direction, and you can walk confidently to the next node. If you are crooked, or try to hurry, it will not work. You cannot step off the ends, no matter where you are going, but you can easily step off the side. Fuss with the direction you are standing at before you go, and it's not too hard. Cross three planks and jump. First, follow the path shown here. 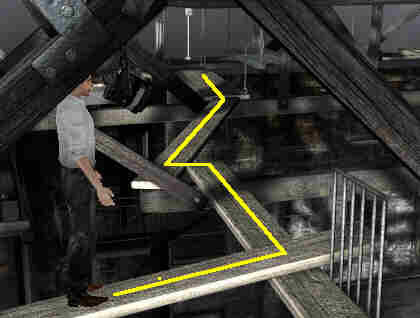 Then starting at this position, run (hold shift while walking, then let go of shift and press X) to jump to the platform. Turn around, step (Up-arrow/space) to the lift. Now here's a mystery - I have never survived that step, but always get transported to the next area - the stairs. Then, through the railings - Left, right, left, step down to the next planks. These are easy. Follow them around until you see the top of the ladder again, turning off the moving lamps, and climb down. You reach a landing where there is no way down, except a doorway. It leads to the first floor of the Hotel. Enter, go down to the ground floor, and prepare to get to the telephone. Answer the phone IN FRONT of the reception desk. Robert Marvin-Jordan invites you to his room for a chat. He says "First door on the right, after the Reception Desk." Ignore his instructions, rather go back up the stairs, straight across the hall, and turn just lightly left. There's the office door. You enter, and automatically show him the videotape of the girl drowning. After the ensuing conversation, step closer to him and initiate the conversation, asking all questions. During the process, he gives you the key to the soundstage back door, and two room keys. 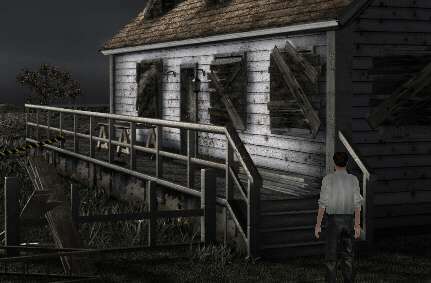 In the Motel Courtyard, go to the door just to the right of the ladder. Inside, turn on the TV. It seems someone is observing this very room. Where is that camera? Look down, at the left end of the TV table. In the cabinet is jar with someone's eyes in it. Yuk! Take the Saboteur Card from behind the jar. Open the large door, look at the camera and pick it up. Watch it! Someone's taking pot-shots at you. You go outside and talk with the sniper. When he asks you to get closer, say No. (Say yes if you like; you won't have to replay very much.) He gets pushed off the roof my a large man in a red shirt. Haven't we seen him before? Looking at his corpse, you can see a key, but cannot pick it up. Go back into the room. Look at the bookshelf to find some evidence. Examine the Wall Street Journal next to the phone, and the Crucifix to discover the camera. Read the Bible quote. There is nothing in the closet or the bathroom. Climb the ladder, and open the door on the right with the Psycho Card. On the TV stand, observe the cards that read "Norma Basten." That's the name of the drowned cinematographer. Rearrange them so they spell "Norman Bates" and you will be able to pick up the Topaz Card. Look at the makeup case and observe the word "GORBY" on the sticker. The letters stand for the initials of colors. Put the colors in the slot in order: Green, Orange, Red, Blue, Yellow. Then open the case and observe the death mask. Yuk! Before you go, take the nail file from the right-hand end of the shelf. Examine the bookshelf to find the red volume "Sexual Aberrations of the Criminal Female. Open it, and huh? nothing inside. Wait, there's a hotspot on the inside of the front cover. Use the knife there to get the Cyclo key. On your way across the room examine the overhead fan. Use the nail file to unscrew a blade and see the hidden camera. At the other end of this same balcony, enter the sound engineer's room with the Topaz Card. On the wall, to the right of the TV is a sketch of Alicia with her measurements. Click on it to cycle through several women, all measured. Look at the bookshelf, and find the small videotape. Open the attaché case to see a psychic flash of someone stealing his case. Read the Bible, and take the binoculars from the nightstand. Play the videotape to witness a brutal murder, followed by the perpetrator having difficulty stuffing the corpse into a container. Use the binoculars on the window for another clue. Open the closet and see the belt with a combination lock. Use Alicia's measurements on it; 35-24-35. It yields another clue. Go up the stairs one level, and into the door at the head of the stairs. At the TV stand, two drawers will open. The lower-right reveals a nice model. The left-hand one is another model, this one of the Manor. Open the top of the model and examine the story-boards, cycling through them. Check the rope hanging out the window. Pull it, and retrieve a basket containing an envelope with incriminating pictures, Cycle through them. See the bookshelf. It contains two items, a book on the top shelf, and some evidence on the bottom. Read the Bible, and see the heart pills. Open the closet and examine the pocket. You get the Torn Curtain 2 card and a grisly clue. On the TV stand are two documents. One implies that the actor is being sued for libel; the other suggests that he had diabetes. He is cured, but is going blind. Does this have something to do with that medication? Go to the back door of the soundstage (that's way around back, not the side entrance) and enter. Go into the "Silent" room with the Cyclo key. Click on the control console for a psychic flash. Look in the Trunk of the car to find a body. Examine the pink scarf in the hand for a flash. Open the drivers-side door. Press the brakes for a flash. Open the glove compartment and take the 1st Broken Cut Card. Exit the soundstage. Go further up the street, past the phone booth, and into the office. Pull down the window-shade before you go into the next room. In the next office, yet another corpse. Examine it closeup, and take the remote by prying it loose with your knife. Also use the knife on the green pill bottle, which has been glued shut. Then select the remote from your inventory, and press space to activate it. (You must be standing next to the corpse to make the remote work.) Press green power switch, and watch 1, 2, 3 movies. Exit the office building and answer the phone. A woman tells you to take the card from the change slot, and meet her in Brenner's house. Take the card, and take the glue. Select the glue, then one of the two halves of the Cut card to join then together. Go to Brenner's house, which is across the street, and the last building you come to before the painted set. Do not go inside until you create a saved game. This is what Brenner's house looks like - it is unmarked, and could be hard to identify. When you enter, you become trapped. You have ten minutes before the bomb goes off. The are two ways to get into the bomb's control; you can break the glass or you can find the key. While you are poking around, you might be offered the chance to cop out, costing someone else their life. Say "No." To find the key, you need to examine the bookshelves and read Plato's Republic. Not the whole thing, actually, just the Greek Pi, which if you remember your geometry, equals 3.14191... Thus, the combination to the little box on the coffee table is 314. There's your key. If you didn't find that obscure little clue, there's a simpler way. Pick up the Fireplace Shovel. Go get the library ladder, climb up to the bomb control box and whack it with the shovel, or unlock it with the key. Then you can cut the wire using either the knife or the scissors. Enter Ingrid Petersen. Complete the dialogue with her. In the process, you learn that there is a secret room in the Manor House. How would she know that? Remember: "Things are not always as they seem." Exit the house, and go to the phone booth. Call Jack and he advises you to poke around the Manor House. As you enter, you should see Jack exiting Robert's room, carrying the medical supplies. (If you don't, not to worry, this scene seems to work only part of the time.) Either way, go to Robert's room and finish the conversation with him. He has authorized you to explore the house, so most of the rooms will be accessible now. Check out Alicia's room. Click on the wooden pelican for a psychic flash. Also look at the books above the pelican. On the other side, Alfred the trusty pesky Mynah Bird is there, guarding the place. Scare him away with the gun. Click on the Polo (Croquet?) mallet and take the wooden fish. Use the wooden fish to pry open the pelican, and retrieve the cellar key and a recipe for Apple Crumble. Sounds good! Read the postcard. Go across the hall to Grandma's room. Just inside the door, there is a tin of fortune cookies on the chair. Read two of them. One is in Latin: It says "You too, my son." Look at the 1982 calendar next to the chair. Two dates are circled: July 2 and August 25. To your left is a record cabinet. Three can be 'played.' The Eroica opens the music box and reveals a paper. The soundtrack from Psycho will give you a flashback, and the tribute to Mary Rose will give you some information. In the other corner of the room, look at the painting on the easel. Another clue. Then, the nightstand. The Bible yields a bizarre quote, and beneath, is the book "Hiroshima My Love." Look in the wardrobe and observe you can pick up the purple dress. Maybe later. Have a look in Jack's room. There's some suspicious evidence here: books on parapsychology and poisoning, another weird Bible quote, and some strange paraphernalia inside the little doors. Also observe another security camera hidden in the overhead lamp. You have the key to the cellar; time to check it out. Go around to the shelves under the steps. If you did not take an apple from the kitchen, take one now. Beneath the apples, open the door and take a bag of flour and a packet of cinnamon. To the right, check the jar with a brain in it, and some comment about AnDia. Below, pick up the Birds Machine. Opposite, look at the two books; one on bird's language and ultrasound, (they really should credit M. C. Escher for the artwork) and Alicia's journal of experiments. See the tribute above to Dear Walter. Exit the Manor and (F2) use your PDA to zip back to Brenner's. On the coffee table, read the note in the envelope. Then, find the book "Confessions" by Jean Jacques Rousseau, on the table next to the bookshelves. Open it and take the "Heaven's Gate" bookmark. That implies it's time to go to the church. Have a look at the graveyard before going inside. In the shed, look at the workbench on the left, and take the saw and read the list. Looks like somebody has their murderous agenda all worked out. Also notice the new headstones stacked in there. As you start to explore the graveyard, a shadowy figure is seen going into the church entrance. Go into the church. Head up toward the front, and climb into the pulpit. Use the Heaven's Gate bookmark to open the secret panel. Open the box, take the Saboteur Card, and open the sealed letter to Alicia with your knife. Oh! Constance Marvin-Jordan is still alive! She also left a letter for you. So that's who we met at Brenner's house, calling herself Ingrid Petersen. No wonder she knew about the secret room. Now all this intrigue is starting to make some sense. Go down the pulpit steps. and look further back on that same wall. There is an alms-box that dispenses candles. It takes quarters, which we will need to acquire. Next to the box, is the doorway leading to the belfry. Climb the steps until somebody shoots at you and you get the 'action' cursor. Press space. Whoops! There goes Constance. Examine the body to discover that she was stabbed to death before you shot. Check out the stained glass windows. The Saint Robert stone moves, and is hiding the Psycho 2 Card and the Red Slide. Take them. Go into the Sacristy, the door to the left of the altar. On the table is an 'interesting' book, and a plate with some coins. Take the coins. (Optional: There is a closet where you can find a Heaven's Gate bookmark, if you did not get the one from Brenner's house. If you did have that one, this one is superfluous.) Go play the slot machine. Get the Michael Keller videotape; a box of AnDia, and the Blue Slide. Take some more coins and go to the candle-dispenser. The second 'candle' from the right is a murder confession. Time for confession yourself. The left side is locked, so go into the Priest's side. Wow! So much for compassion! Looks more like decompression to me. Sinners beware. Well, it's safe to look in the other side now that the knife has been triggered. The book provides a clue to opening the device on the altar. Scottish highlands, a trap, and a tiger. Take the cloth from the seat, and open the purse. The nail polish falls out. Pick it up; you just never know . . . Then open the purse and look in the wallet. Won't open? Try the knife on it. Constance's driver's license and a note suggest that this is where she got stabbed. Go to the altar, and turn the three levels to reveal mountain, cage, and tiger. The door opens, and you can access the small drawer to find the Topaz 2 Card. Back away by closing the drawer, back out, close the door, back out again. Exit the church, and the Mynah bird tells you Alicia is in danger. Say 'yes' and get transported to the swamp. Don't feel rushed by the bird. Alicia's in quicksand. She'll keep. Nobody ever drowned in quicksand unless they struggle constantly. If it ever happens to you, stand still and you'll be fine until help comes. (Don't ask me how I know this!) To the left is a scarecrow, and to the right is Alicia. Go first to the scarecrow, cut it down with your saw, take the pole, then go to Alicia. (There was another Birds Machine at the scarecrow, in case you missed the one in the cellar.) Now go down the other down (throttle that bird for me, please) and save Alicia with the pole. Oh! She can speak. Now she not only talks, she wants something hot. Do you have a recipe on you by chance? And all the ingredients? Go to the kitchen. Stop at the Fridge, in case you did not take the butter before. Go near the stove. Now, this part gets really cranky. It's far easier to make real apple crumble in your own kitchen than to do it this way. Look at the cupboard to the right of the oven. Take the large spoon and the bowl, which goes on the counter. Remember, Right-Click accesses your PDA. Anytime you need to review the recipe, Right-Click, and select Recipe Ingredients, and the recipe itself is at the top of the list. Now, select Recipe Ingredients; Apples, then select knife to slice them. Then select Recipe Ingredients; Lemon, and select knife to slice it. Then at the bowl, select Recipe Ingredients, Apples. They drop into the bowl. Then select Recipe Ingredients, Lemon slices (it squeezes a lemon, not drops slices) . Put them in the Fry-pan to cook. Then add Sugar and Cinnamon, Stir with the Spoon. Next you need another pan. Open the oven to find it. Then put the butter, brown sugar and flour in the bowl. Use the spoon to combine, and put the finished product in the oven. Turn on the heat with the left-hand knob. Go away. (A watched pot never boils.) Go check out the brandy or the fridge or something. When you come back the Apple Crumble is done. Take it, and go see Alicia. (Mmmmm. send me a piece before she eats the whole thing, will you?) Go through the entire dialogue with Alicia. Exit Alicia's room, and go listen at Jack's doorway. He is drunk and hallucinating about Mary Rose. Go to Mary Rose's room, take the dress from her closet and put it on. Cuuuute! Really goes with that goatee! Go visit Jack, frightening him. Mynah, Mother's Little Helper, is sitting right there on the newel-post. He becomes your Mary-Rose voice. At the end of the conversation with Jack, you will have the Library key. Find the Library by going up the staircase in the large hall, the room next to the cellar entrance. Before going up, there are several clues to gather in the large room. On the left-hand wall, a tribute from Ronald Reagan, over the East fireplace, a portrait of William Jordan, over the West fireplace a portrait of Mary Rose. Click on her for a psychic flash. In the top drawer of the right bombé chest, a family album. Go up to the library and enter the left-hand door. On the opposite wall is a large bookcase with left, center and right sections. On the right is the Encyclopædia. Click on the letters A-N-D-I-A (Books 1, 3, 2, 4, 5) to open the drawer containing a letter from Walter Slezak. Above the drawers, to the right is a note offering slogan proposals for AnDia. Below that note, on the next shelf, is a cigar box. Open it and take the cigars. Then, on the left side, is another cigar box. Open it and observe the empty space. Put the Corona cigar in that space. Then take it back, and it changes into the Winston Churchill T/A cigar. Put that cigar in the space, and the bottom drawer opens, revealing a file about William Morton's large financial practices. Take note of several deals with Coska. Behind the cigar box is a tumbler containing drink stirrers. Take them. Select the Coska stirrer and use it on the third drawer down to read a file about Stefen Fischer. Back away, look up and examine the pull-down screen. Click on the postcard-like area, and use the stamp from your inventory. (That's the stamp you picked up from the desk in the first scene, in the office.) It opens the second drawer. Take the Thornhill tape, and read the letters from James Thornhill and Mark Jones/Michael Keller. Optional: Go to the far right wall and look at the Psycho artwork. Exit the library and exit the front door of the manor. Jack's raving about not being able to swim, and something about an octopus gives us an idea. Go around back to the swimming pool. That's down and around the side toward the Topaz Gate. Approach the pool, and get the action cursor. Press <space> and in you go. Use the arrow keys to turn slightly right, and the up arrow to swim forward to the hatch on the bottom. Open it, take the box out, and open it to find a list of instructions for Jack. Poor fellow! No wonder he seems stressed out. Exit that scene, and the next chapter begins. Note: Reports from players indicate that if you save and quit between the pool and the library (you can do them in either order) you can create a dead-end. Be sure to finish this chapter before you quit for the night, or you'll have to re-do it. As you leave the pool area, you will automatically pop in on Alicia. When you get the action cursor, select the Birds Machine from inventory. It has several controls: The four white buttons across the top select what kind of sound is produced; thus whom it affects. The two silver buttons in the middle are not adjustable. The wheel changes the level of intensity from one (top) to five (bottom). Talking with Alicia, you need the third white button, the one that sounds like a music box. First use level one, then level two. Then she plugs it in so that the sounds reach her uncle Robert. Use the first white button, the screeching sound. First level one, then level two, until he can't stand it. You automatically exit her room, and he calls you to his. You have to investigate Jack. Where could he be? Graveyard, perhaps? Before you go there, check out three more rooms at the Motel. Find the Cinematographer's room. It's just behind the plants where you found the red sock and the key. Find the hatbox in the closet, and red the letter inside. It seems Constance wasn't completely innocent, either. At the TV stand, notice the hidden camera in Liberty's eye, and get the psychic flash from the pen. You can play any of your videotapes on the TV. At the bookshelf, find the Incredible Truth about Grace Kelly, and observe the image of the compass on the DVD cover of North by Northwest. 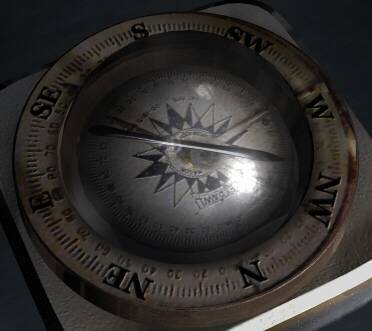 As you do, you hear a slight 'clink' sound, and the compass no longer adjusts. When you back out, there is a file visible at the right side of the shelving that was not previously there. It seems she was planning to publish an exposé of MJI's activities. 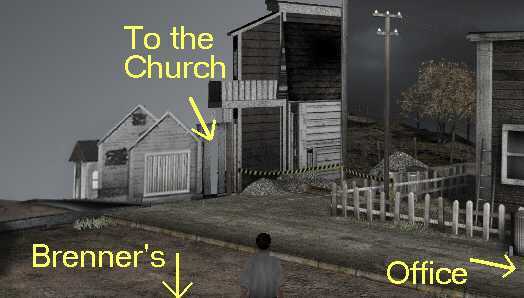 You probably should create a saved game before going to the graveyard, although I am assuming you created one recently, after finishing Chapter 5. You encounter Jack, who has a gun; so he's in charge of things for a while. He wants you to place the tombstones on the correct graves. Ow! Hasn't anyone ever told Joseph how to lift heavy objects without straining his back? It hurts just to watch him. Maybe the sequel will feature a Chiropractor! The order you find them in the shed is: Armstrong, Ferguson, Elster, Toothbridge, Gromek, Basten, Tyler, Samuels. So - o - o confused yet? What's worse, only the first few names are readable as you pick up the stones. The rest you must guess at. Use the stones on the graves in this order, numbering from one far back to eight close-up. 3, 1, 5, 7, 2, 4, 6, 8. Just when you thought you were finished, there is a ninth grave to prepare. Oh well, at least this time you know whose stone goes at the head of it. Heh-heh. When Jack-who-is-not-too-swift turns around, just press space to depart the graveyard, and you will end up in the house. Go upstairs and talk with Robert. Talk to him about all the murders. You will find yourselves in the secret room. The conversation continues until Robert threatens to shoot. Press space, and Robert is shot dead. (His gun was loaded with blanks.) Examine the body and find the Card. You find yourself back in his room. Look through the books aver the bed. It seems he has more than a passing interest in Joseph Shamley. Has he been setting Joseph up all along? Look especially at the book on the other side of the bed, the one that refers to the solstice, the shortest day of the year. Look at the desk in the opposite corner. Over the desk is a map of Bellagio Bay. Almost looks like Myst Island, doesn't it? Look closely at the desk. You must adjust the earth, the date, and position the boat. The earth goes to the far left, the date is 12/21, and the boat goes to Ithaca. The desk is unlocked. Look in the drawers and take the Frenzy Card, the Frenzy 2 card, and the Safe Card. Go down the stairs and into the office. Open the safe by selecting the Safe Card. The three drawers inside are all accessible. Read all documents, and take the slide viewer and the Green Slide. You should already have the Red and Blue slides. When you exit the safe, Alicia comes in and has an automatic conversation with you. At the end of the conversation, select the slide viewer. Put all three slides in the viewer to reveal a secret door in the bookshelves. Go down to the viewing room and sit in the red chair. Turn on the power, then select the center screen. Oops! Now we know what that funny screen test was all about. The editors joined our image with another, to make it look like Joseph killed Constance. Alicia needs to be convinced of Joseph's innocence. Keep playing film clips until you have the close-up mode. Look at Constance to see that she has three hands. Thus, the real killer is revealed. (Don't forget to back out of the close-up mode while the dialogue continues.) Jack comes in. Complete the conversation with him, sit back and enjoy the closing scenes. More brandy? All images and concepts property of Wanadoo Édition and Universal Studios.